Traditional or reverse flare headstock. Neo-classical fingerboard with or without floral inlay at 12th fret. Matching tailpiece, bridge, pickguard and headstock. 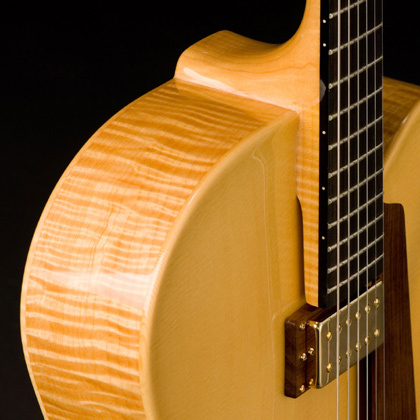 All woods are AAA Sitka spruce and big leaf curly maple. One piece flamed maple neck with 2-way adjustable truss rod. Available in natural, vintage blonde, sunburst or violin finishes. Available in 16, 17 or 18 inch body.